Please complete the form below and your enquiry will be sent directly to Camphill Sports Challenge via email. Your enquiry has been sent to Camphill Sports Challenge. 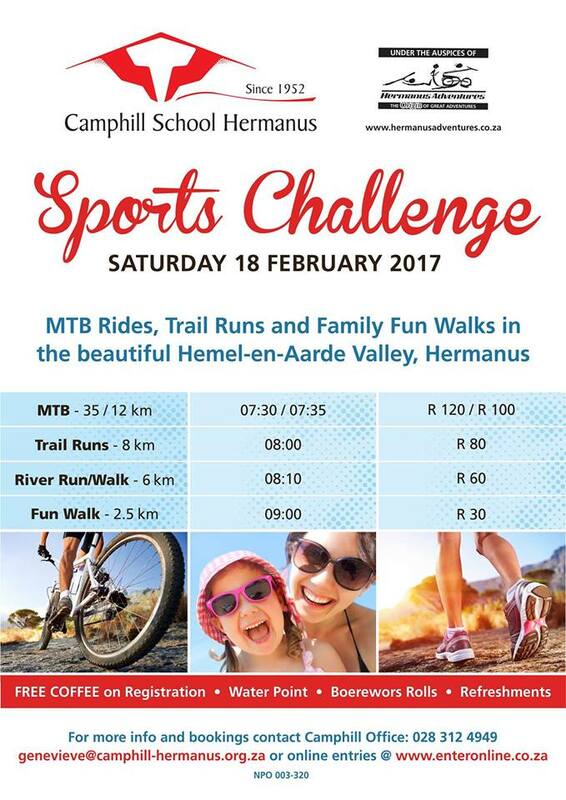 Join us for the Camphill School Hermanus Sports Challenge! Saturday 18 February 2017 is our first fundraising event of the year! There’ll be mountain bike rides, trail runs, a mom's and tots fun walk and boeries galore. Enthusiastic MTB cyclists and trail runners will be able to master the challenge of the tough courses laid out for them uphill and down across the Hemel en Aarde Valley, while scores of walkers and less energetic runners of all ages, jog or stroll their way around gentler routes, some beside the tranquil Onrust River. All the routes, amongst the most picturesque in the Western Cape, have been designed by Hermanus Adventures, under the leadership of Paul du Toit of the Wine Village. Our annual event includes MTB Rides, Trail Runs and Family Fun Walks in the beautiful Hemel-en-Aarde Valley, Hermanus. Free coffee on registration, water points, boerewors rolls and refreshments will be on sale. All for a good cause so come along and have some fun with us.